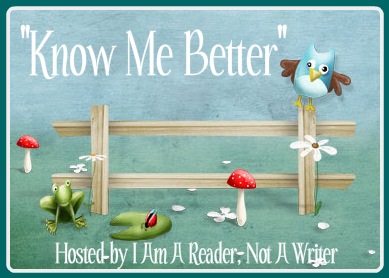 “Know Me Better” is a weekly meme hosted by I Am A Reader Not A Writer. Each week five questions are asked as a way for your readers to get to know you better. Want to play along? It’s easy! Just click the link above to take you over to the host’s page. From there, copy and paste the meme image into your blog along with the meme code. Link back to the host and you’re done! I don’t know because I don’t know what people think. LOL I do know that a few years ago, back before Facebook, I posted a picture to a Yahoo group I’d been an active member of for years. Several people expressed surprise at my hair color. It seems everyone had envisioned me as a blonde. I don’t even want to examine that too closely. Eh, neither, really. I’m not really a water person. I can take low doses of the beach, and the pool is fine if I have something to do. As much as I love to read, I don’t really enjoy getting crispy while I do it. If you had 24 hours alone how would you spend it? I have lists and lists of things to get done when I have no distractions. But if you’re asking what I would choose to do with 24 hours alone, it would be reading, sleeping, and eating ice cream. Neither. Dr. Pepper or water. Well, apparently I should pick someone blonde, but I won’t. In junior high and high school, people told me I looked like Alyssa Milano. I didn’t see it then, and I certainly don’t see it now, but at least she’s the right age.